15 YEARS EXPERIENCE IN GYM TRAINING,EXERCISES & PERSONAL TRAINING,AERO X (for weight & fat lost)& LEG WRESTLING(fun game). 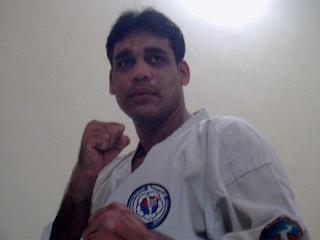 20 YEARS EXPERIENCE IN TAE KWON DO,KICK BOXING,BOXING,MUAY THAI & MMA. 2ND DAN BLACK BELT IN SEPTEMBER 2007. HAVE WON MEDALS IN DISTRICT,STATE,NATIONAL & ONE INTERNATIONAL(won pepsi cup in alkhobar,saudi arabia). WON TITLE IN PRO KICK BOXING IN ORISA. ATPRESENT COACHING IN POONA COLLEGE. 07.00 PM TO 08.30 PM. PERSONAL TRAINER FOR GYM EXERCISES,TAE KWON DO,MUAY THAI,KICK BOXING,BOXING & MMA.